Surprisingly, there's a long history of fishing titles on the consoles, starting as early as the late eighties. 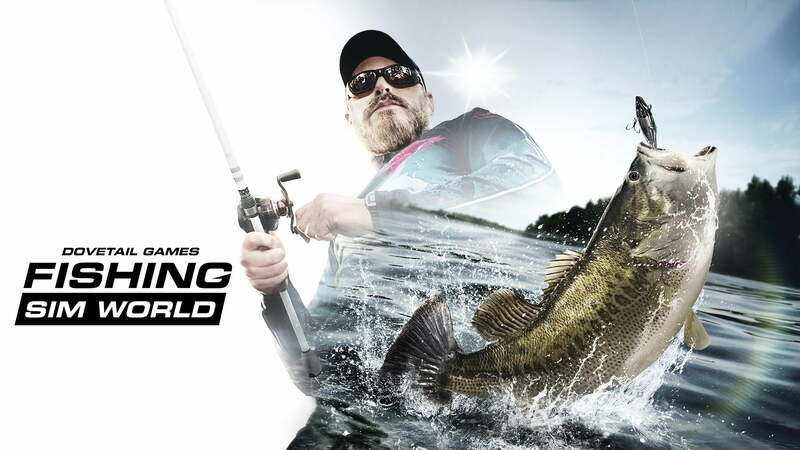 It's not a sport that you'd expect to translate to the virtual gaming world with long periods of time spent patiently waiting for the fish to bite. Yet, the titles keep coming and keep on improving, bringing increasingly realistic fishing worlds and environments to players. 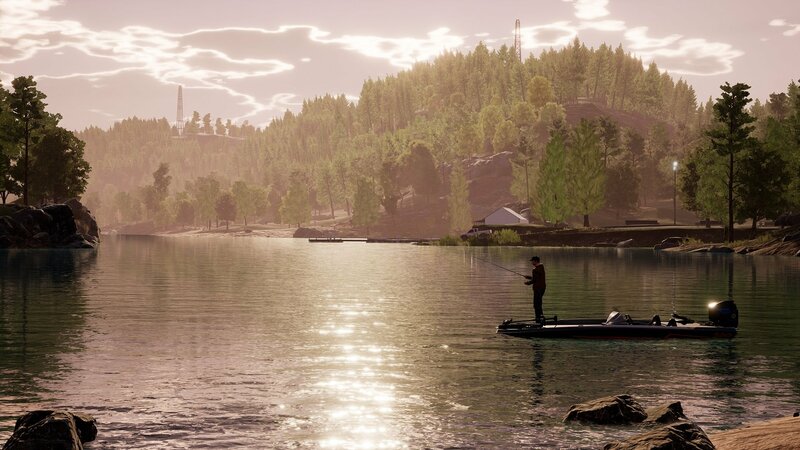 Dovetail Games' Fishing Sim World attempts to be the most authentic simulation yet, challenging fans of the sport to use their knowledge and skills to capture trophy fish in some very impressive looking real-world locations. 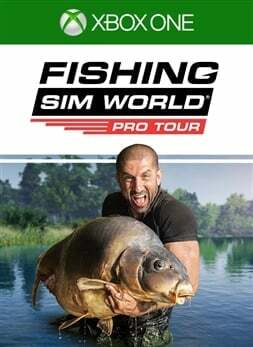 Fishing Sim World takes the player around a number of lakes across Europe and the USA. Whilst there are only seven different locations, the actual lakes are extremely large expanses of water from shallows to deep water. Each features a number of pegs that can be claimed, and for heading out to deeper waters, players have a motorboat at their disposal. Somewhere hidden in the depths of those freshwater lakes are eighteen different species of fish waiting to be caught, and Dovetail Games have included hundreds of tackle items from recognized brands to help the player land those trophy catches. With the time of day and weather all affecting the how the fish will bite, you'll be needing the right bait, equipment and angling knowledge to ensure you don't leave your pegs empty-handed. Visually, the game is a mixed bag. The main character model is not entirely convincing. Even with the various hairstyles available, you'll still be happy that your character can wear a cap. The background detail too can lack a certain level of detail and definition that you might expect from new titles. However, the water effects and the way the line touches the surface of the water as you cast or reel in, is all very convincing. It's here that the anglers in the community might spot some nice little touches. The UI is simple, displaying the reel tension, the line tension, the reel speed and the distance and depth of the bait, and icons indicate what is going on with your rod or bait. It is the soundscape, or some would say lack of it, that sets this game apart. The in-game menu music is quiet and subdued, perhaps deliberately understated, but out on the water, there is no music soundtrack at all. The player is left, much like in real-life, surrounded simply by the sounds of nature, and strangely, the odd passenger jet in the distance. 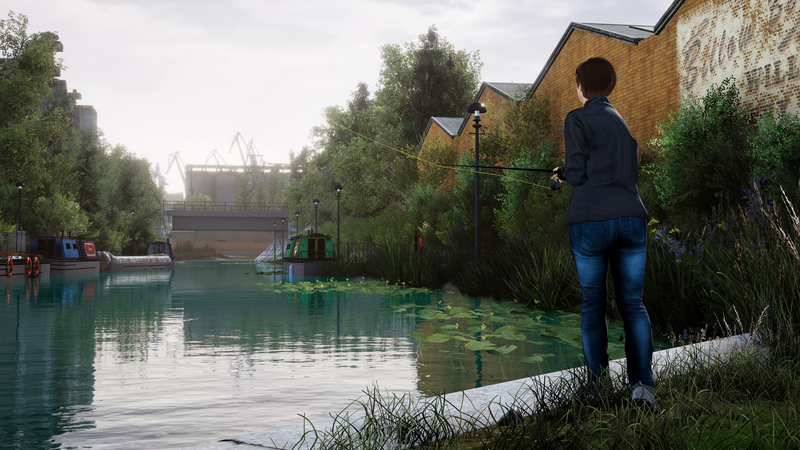 For some, this is part of the joy of angling, the tranquility and the sounds of the wildlife around you, and Dovetail Games have resisted the temptation to put an obtrusive soundtrack over the game and left the virtual anglers to enjoy the peace of the outdoors. It works surprisingly well, with the chirruping of insects and birdsong providing a realistic background. Naturally, those looking for another sort of audio experience can always leave their favorite music app playing in the background. Gameplay is relatively simple at first glance. 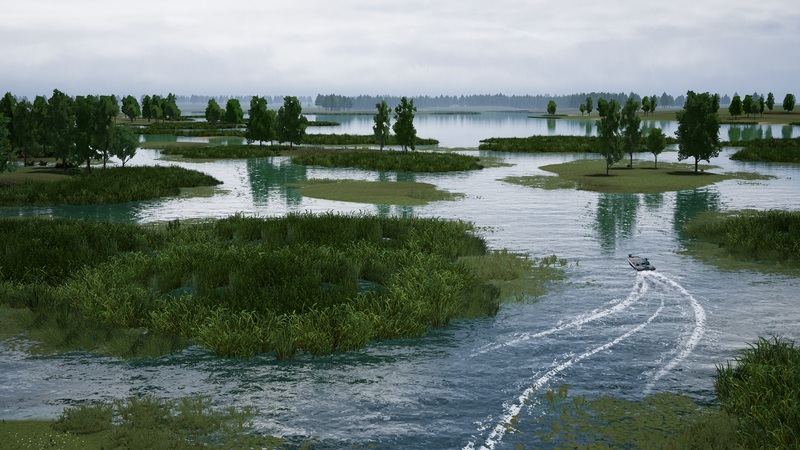 Players can select one of the seven different world locations and select a peg to fish from. Equipment can be selected from the tackle box and you can start casting using one of the three rods that you carry. It's up to you whether you fish with a single rod or decide to have all three lines in the water, although that can be a little busy at times, and the mechanism for swapping rods was one of the clunkier parts of an otherwise smooth interface. There are two methods of casting; simple use of the left and right triggers, or flicking a thumbstick to replicate the action of swinging the rod. The latter was meant to give a greater degree of freedom, although the trigger method worked perfectly fine. Once cast, an indicator will appear over your bait indicating either the surface that it is lying on, silt or weeds, or the behavior of the lure if you happen to be using one. It's here that the simulation part of the title really starts to kick in. Just like in real-life fishing, select the wrong bait or tackle and you'll find yourself whiling away time with no bites. This is complicated further by having to take into consideration the time of day, the weather, the temperature, and the breed of fish you are after. Additionally, you'll need the correct strength line and reel for those moments you have the fish on the hook. Landing the fish requires careful juggling of a number of factors. Reel in too fast and you run the risk of losing the fish. Put too much tension on the line and you'll get the same result. The player has to tire the fish, reeling in, releasing the line and reeling in again. A landing net icon will appear when the fish is sufficiently tired enough to be caught. Things get a little more complicated again if you decide to fish using the lures. Each one is designed to behave in a specific way and you'll have to change your reel speed or perform the occasional twitch to mimic the desired behavior and entice the fish to bite. Once they've taken the bait, you'll need to perform a strike via a thumbstick to really secure the fish on the hook. Bad timing and the fish won't be securely hooked, meaning there's a good chance of losing the catch before you're able to land it. All-in-all, the game does capture the joys and frustrations of angling as a sport. There's that patient wait after the bait hits the water, waiting to see if the fish will bite. There are moments of anxiety when trying to land a large catch, that's just on the limit of the breaking point of your line, and those larger breeds demand a certain degree of patience when trying to land them. It's very nicely done, and the anglers in our community will recognize and appreciate those moments. In perhaps the only concession to gaming, the fish seem to bite more often than their real-life counterparts. As long as you have the correct bait and equipment, it's unlikely that you'll ever end up with an empty net. Landing fish will earn you XP depending on the size and breed of fish. Eventually, you'll start leveling up which earns you a certain number of tackle points per level, with a bonus at certain milestone levels. Tackle points are the in-game currency which can be spent on new equipment to add to your tackle box, new personalization items for your character, or even a new speedboat should you want it. It's worth noting that for other than the open all-comers tournaments, you'll have to pay an entry fee if you want to join some of the more prestigious competitions. The only minor frustration is that you have to unlock tournaments by winning a previous one, and they are not all open at the start. Naturally, the bigger the tournament — played against AI in single player — the bigger the awarded tackle points on winning. Incidentally, with respect to tackle points, this is all in-game currency, there are no links to real currency, microtransactions or loot boxes in the title. The gameplay mechanics remain unchanged in both offline and online modes. 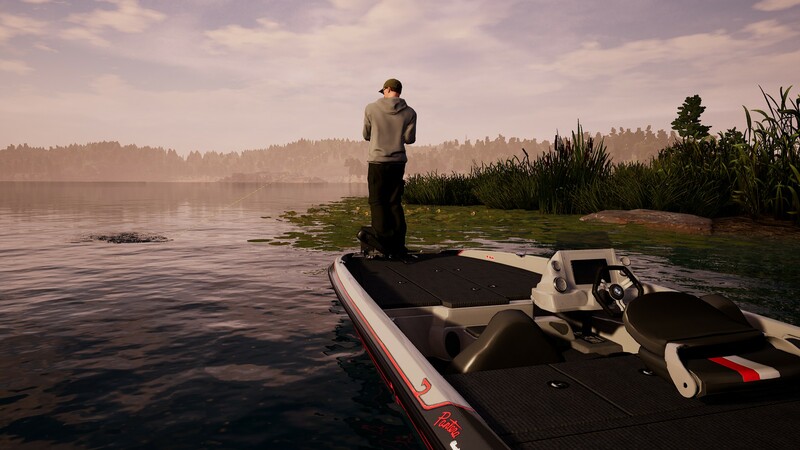 There is a free roam mode for single player that allows you to fish for as long as you want, wherever you want, and you can select the time of day and the weather to suit your liking or to specifically target specific breeds of fish. Competitions and tournaments are available in both, which means facing off against AI or real players depending on the game mode. The rules vary per competition with the winner decided either by weight of fish, the number of catches, or total length of fish in the predatory category. Online, Dovetail Games have introduced its own set of tournaments which are updated on a periodical basis, and naturally, there are online leaderboards to track all of this. If there's any criticism of the title, then perhaps it's more with the misleading title. The number of locations in Fishing Sim World seems a little limited. There is only freshwater fishing featured but without any fly-fishing. Being freshwater only, there's no heading off to the oceans for a spot of sports fishing. And for someone who used to spend hours perusing the glossy pages of fishing catalogs, drooling over shiny lures and new equipment, there doesn't seem to be much choice for your own tackle box. However, what was presented was a highly enjoyable virtual fishing experience, and you were left wishing there was more to explore and experiment with. Despite there being only 25 achievements in the title, those looking for a quick achievement boost might be in for a little surprise. There are achievements for both online and single player modes, most being allocated to the latter. 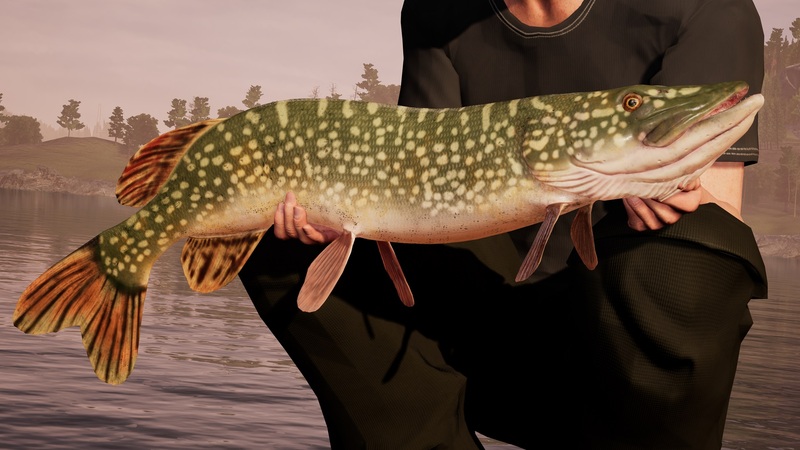 There are also generic achievements across game modes for catching so many fish of particular size or breed. The problem here is that there is no guarantee of which fish will take your bait so it could take some time to unlock those achievements. For some, that will be a grind, but for the anglers amongst the community, it will simply be a labor of love. The reviewer spent around 10 hours trying to recapture the joys of rod and line from his childhood. Three of the 25 achievements were unlocked and over 100 fish hooked. The download code was provided by the publisher for the purpose of review and the title reviewed on the standard Xbox One console. Andrew has been writing for TA since 2011 covering news, reviews and the occasional editorials and features. One of the grumpy old men of the team, his mid-life crisis has currently manifested itself in the form of an addiction to sim-racing - not being able to afford the real life car of his dreams. When not spending hours burning simulated rubber, he still likes to run around, shoot stuff and blow things up - in the virtual world only of course.